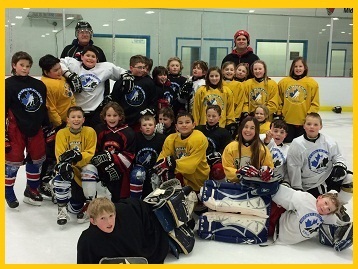 The Hockey Academy focuses on skill development. As players move through the program, the drills progress to allow the players to progress as well. EBUS Hockey Academy is entering its sixth season and we plan to offer programs for grade 5/6, grade 7/8,and grades 9-12. Players on ice behavior will be similar to their classroom behavior. Players must be in good standing in their course work. Players must be up to date with their homework and assignments. If a player is behind, they will stay at school and participate in their regular class activities and complete their work. **Hockey is known as a collision sport. Players risk injury from high-impact collisions with each other, the rigid boards that mark the boundary of the playing surface, and the goal posts. Impact with a skate blade, long sticks, and pucks travelling more than 60 MPH also add to the risk. It is estimated that direct trauma (a sudden forceful injury) accounts for 80% of all injuries. Most of these injuries are caused by player contact, falls, and contact with a puck, high stick, and occasionally, a skate blade. As noted above, hockey is a high risk sport. If your family does not have adequate health care insurance, please consider additional health care insurance.